At 5’7” tall, you might think that I would not be scared of a 20″ box jump but you are wrong. I was scared not because of the box but because of flipping over and hurting my shin or falling face first. It was Elena, Reps Gyms Owner’s wife, who encouraged me to take the first leap of faith. The first time I attempted to jump the box, I hesitated, edged towards it, but backed away and prayed. “Don’t be afraid. Don’t think of the fear. Just jump.” Elena said encouragingly. I wasn’t terrified. That was an understatement. I was petrified! “Flop!” was the sound that came off when my knee hit the top of the box. It was a bad landing. Wait, it wasn’t a landing, period! I didn’t even get onto the box. “Dear God, please make me a ninja. Don’t embarrass me please!” I cried pleadingly as I desperately needed to jump. The feeling was intense as it built up inside me. Finally, I took a deep breath and jumped! A loud thud. I had a good landing even though there was somewhat an impact. YAY, I made it! My very first successful attempt. Outside of CrossFit, when was the last time you jumped as high as you could into the air? Maybe if you play basketball or if you’re in the military, that woul be normal. But for everybody else (particularly for women) the need to jump just doesn’t seem to come up that often. The last time you jumped as high as you could might have been at an age that ended in the word “teen” and so you might have some apprehension when the WOD calls for box jumps. Two months later, I challenged myself to do it again. The fear came back and it was double-fold. I stood staring at the box again with the sense of familiar fear and panic. Why was I even panicking? I had no idea. However, I was getting angry at myself and kept telling my mind that I could do this. It took me 15 minutes to muster enough courage to jump. I FAILED. Kim Lee, the gym owner said to me “Karen, attempt jumping onto the tire one at a time to gain momentum.” Here are tips that helped me get through. It doesn’t matter if the WOD is “Fight Gone Bad” and the standard is a 20″ box jump. If you’re not a comfortable, experienced jumper, then use the 12″ box and nail it repeatedly. Then move to the 16″, then the 20″, and beyond. Progress slowly if you have to — but continue to repeatedly challenge yourself and your limits. I parked my fear aside and FOCUSED. 2) Focus on the top of the box at first. Stare at it and visualise your feet planted firmly in the middle of the top. Do this for every jump. As you progress, you can move your gaze forward until you’re jumping with the box in your peripheral vision but don’t worry about that at first. Just worry about planting your feet in the middle of the top. 3) Get mad at the box. It’s a stupid piece of wood and, if you’re scared to do it, that means the box is conquering you. It owns you. How pathetic is that? In my house, we have a saying: “Today, I will not be defeated by inanimate objects.” It sounds really stupid but, the next time you’re struggling with a stubborn jar lid, repeat this saying to yourself and you’ll find yourself twisting off that lid like you’re Superman. –even if you think you’ve licked this box jump fear. Fatigue can do funny things to your mind, as we all know. Focus and refocus and you’ll get through it. 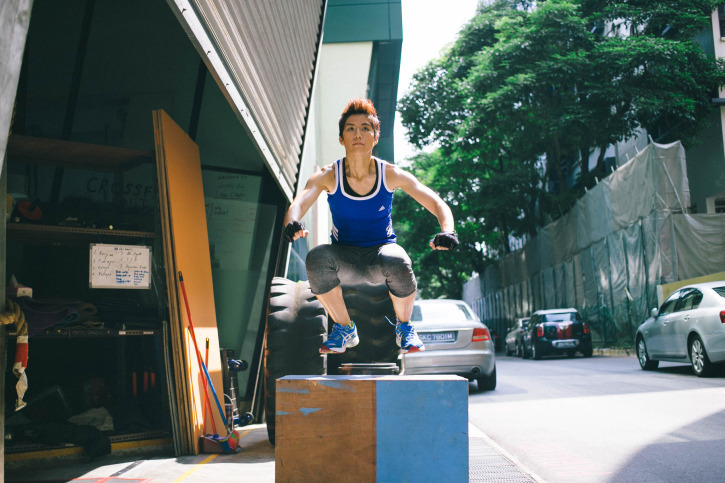 5) Add the box jump to your warm-up at least once a week, preferably twice. It doesn’t have to be a lot of jumps: just 10 at a time. Repeated exposure at low levels will help. Jump immediately. Really. The more you postpone the activity, or avoid it, the worse the fear will become. It doesn’t matter if your shin has a bruise 3″ wide and you’ve left skin on the floor, jump again right away. Don’t wait. Fear is a funny thing. Not “ha-ha” funny but you know what I mean. Fear is simply a Fake Emotion that Appears Real. That’s what it stands for. It’s a matter of telling your mind that you can do it and say it repeatedly. That’s what I did followed by gaining the momentum of jumping from 1 tyre to another and then onto the box. Not 1 but 2 but 3 but 4. Once you’ve mastered your fear of the box jump, it becomes addictive. You’ll want to jump more, and higher, and you’ll find that you no longer want to limit your jumping to the inside of a CrossFit gym. That bench at the park? Jump it. That chair in your dining room? Nail it. Climbing into bed at night? So much more fun than sitting down and swinging those legs over. This obsession can, however, put you in an odd predicament as a jumping grown-up among those who no longer jump. People will look at you oddly so resist the urge to jump in public places. Really. Don’t be like me. Or else you’ll find yourself in a school gymnasium, right under the backboard, waiting to pick up your 8-year-old son after school, in a sea of non-jumping grown-ups, none of whom seem to have the urge that you do — that urge to jump up and touch the bottom of the net. The net is right over your head, after all, the threads hanging down so temptingly. But you are in a pair of dress pants and a shirt with French cuffs, looking to all the world like a serious English professor, and yet your internal dialogue goes something like this: Don’t do it. Don’t jump. Be normal. Nobody else is jumping in their business suit and their grown-up shoes. Really. Just blend in. Stop it. You’re only 5’7″ for God’s sake, you can’t reach the bottom of the net anyhow. Be normal. Be normal. BE NORMAL! Oh, what the hell. Might as well jump! Thankyou for this terrific post, I am glad I found this internet site on yahoo. A good many vallebuas you’ve given me.